Details: CDS was able to obtain funds for 75% of the construction costs and applied to NAFA for the remaining amount of $3,785 to start the construction. We were advised that previously the 6 classes were taught in temporary sheds with tin roof. Outcomes: The application was approved at the NAFA August 2011 meeting for the construction of 6 classrooms and funds transferred soon after through the Joy Foundation Nepal. 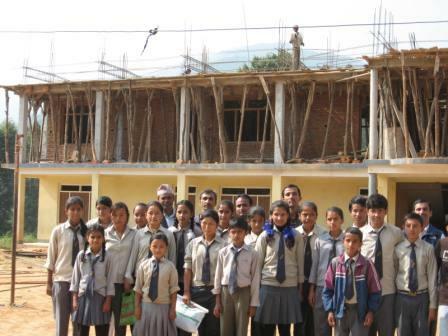 The NAFA Nepal Project Coordinator visited the school in mid January 2012 to view the construction of the classrooms. The classrooms still required the cement roof to be poured after which the interior would be soon finished. The principal advised that the rooms would be ready for the start of the new school year. Since the application was received at the beginning of the year the school had started class 7 and 8. They now advised that when these classrooms are finished the school would be able to go up to class 10.